Over the years there has been many claims of individuals discovering ancient crystal skulls in mayan temples and other places of significance to the ancient world. Hollywood has also followed this story with Indiana Jones and The Kingdom of the Crystal Skull. Their true origins a real mystery but their enigma is still very much alive today. The British Museum in London currently holds in its collection a famous crystal skull in the Wellcome Trust Gallery. The BM purchased this skull in 1897 from Tiffany and Co, New York with a legend that it was brought from Mexico by a Spanish officer before 1863. Over a period of 40 years the museum has examined the skull multiple times in a research effort to determine how the skull was carved. On the other side of the world at the Smithsonian Institute, Washington DC is another famed crystal skull (below) who was anonymously posted to the Institute in 1992 with a letter stating it was from the Aztec empire. However Jane Walsh, the museums anthropologist states "no crystal skull has even been uncovered in an archeological excavation" and "telltale marks on the skull suggest it was made with modern tools". 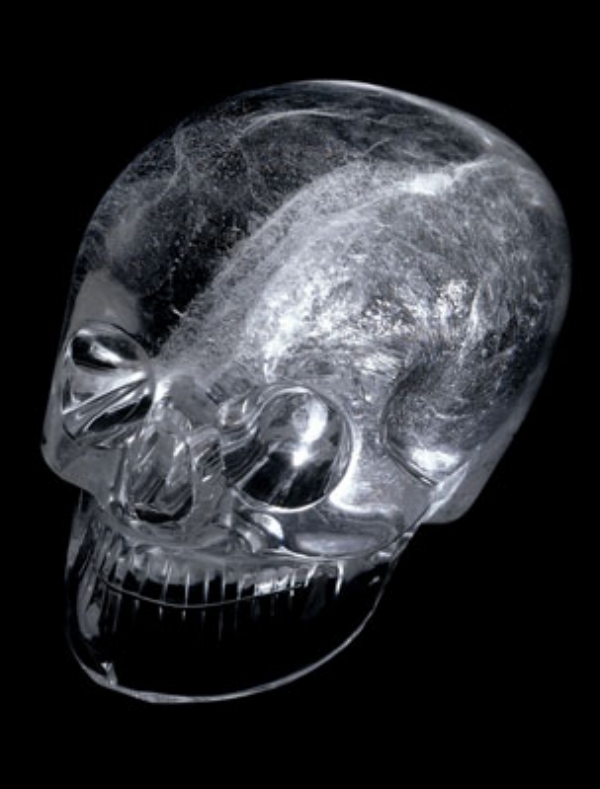 Crystal skulls are fascinating and mysterious and those in the museums are said to be modern creations and not the ancient artefacts proclaimed by those who sold them. 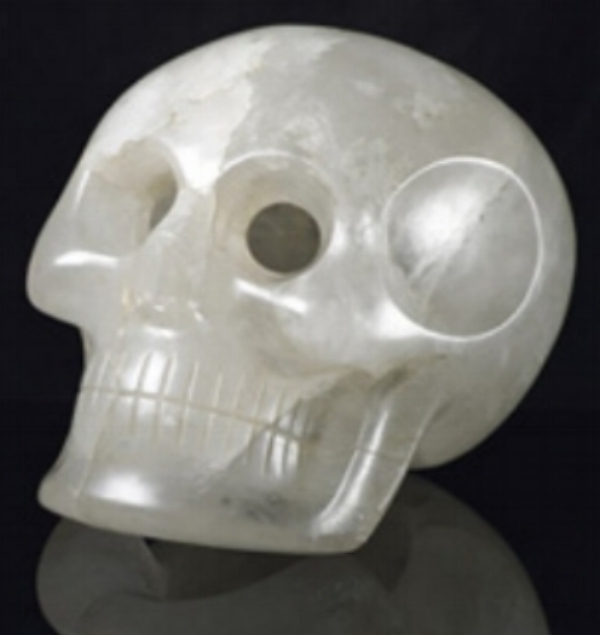 And yet in our research we have come across another culture linked to the crystal skulls - the Tibetan Buddhists. The Nyingma tradition is one of the oldest of the four major schools of Tibetan Buddhism and literally translates in english to mean "ancient" and is founded on the first translations of Buddhist scriptures from Sanskrit to old Tibetan around the 8th Century. Nyingma believe in hidden terma treasures and incorporated religious practice, relics, deities and elements of Shamanism. The Terma tradition believes terma may be a physical object such as a text, ritual implement that is buried in the ground (the earth), secreted in a herb, a tree, in a lake, the sky (space) or hidden in a rock or crystal. Terma is regarded as "hidden treasure" and described as a non-human type of code, knowledge or writing. Central to the Nyingma belief is that this code can only be deciphered by a Tertön with texts suggesting these could very well be significant Tibetan Deitys (nāga and the dakini). Many tibetan artefacts and relics feature both deitys and skulls as an integral element of their design. We have come across Oracle Crowns, Wall hangings, trident/Trisula items, prayer beads, painted artwork, shamanistic masks and you guessed it, crystal skulls. The following remarkable crystal skulls have come into our care and were acquired from Tibetan based antiquities dealers who claimed "are ancient relics" who had spent approx. 400+ years in a Buddhist temple until the Chinese destroyed the monasteries and temples. Interestingly these skulls are not life-like, nor do the resemble the skulls of popular culture from 19th century, the Mayan or Aztect tradition. They are adorned in precious gemstones as was common practice across many ancient Asian cultures. There are not solid which seems consistent with the designs on other Tibetan artifacts (such as those shown above). and the Secret Instruction series (men-ngak-de). Dzogchen is the focus of Nyingma and is seen as the supreme practice and ultimate understanding of the nature of mind, known as Rigpa. They seek to understand the nature of mind without the subtle body practices and visualisations of other tantric forms. Dzogchen works directly with the nature of the mind itself to clear the everyday mind and reach the primordial nature of mind, essentially purity and spontaneity. The skulls come from the same region where in November 1990, Rinpoche discovered a crystal sphere (Shel-kar) buried in the sacred hill of Swayambhu (Kathmandu, Nepal). This miraculous object was subsequently validated as Ter of Padmasambhava by both His Holiness Dilgo Khysentse Rinpoche and His Holiness Kyabje Chhimed Rigdzin Rinpoche. Padmasambhava and his principal consorts and disciples secreted away and hid religious texts, ritual objects and relics etc., to secure and protect Buddhism during the time of decline under Langdarma. Some of these terma have been rediscovered and yet many remain hidden. Are these remarkable crystals skulls recently discovered Terma relics ? So far all Mediums who have encountered these skulls have described them as remarkable and "one of the most powerful earth energies they have ever experienced".